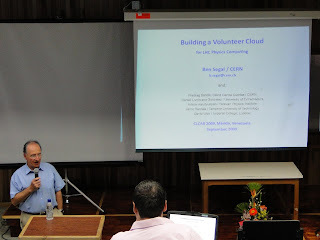 Ben Segal presented today their talk "Building a Volunteer Cloud" in the CLCAR 2009. Prof. Segal discuss about the opportunities of Volunteer computing to build realistic possibilities of High Performance Computing, addressing Cloud Computing. Using BOINC and Virtualization in a Cloud context is possible to investigate the use of either emulation or virtualization for BOINC, driven by the porting considerations just described. We quickly showed that emulation was too slow but that virtualization entailed only a few percent of CPU overhead and looked very promising, given the scale of the potential volunteer base. On the other hand, Segal's talk presents BOINC and virtualization technology as a great opportunity to regional and multidisciplinary projects in LatinAmerica showing good examples of developments in Asia, Africa and Europe. Prof. Segal was made an extended call for motivation and participation in BOINC projects. It was a very good conference, in grid Colombia we are considering use BOINC middleware for one of the OV, that is experiment how colaborate BOINC with globus.